You’ve probably heard colloquially that you should never tuck in your shirt unless you're dressed up. You'll look like a dork. An old man, they say. Well, there's some truth to that. Growing up in the 90's, we went through a rough patch as far as the tucked shirt goes. Button up shirts were cut big during that time, and we're only now starting to recover from all the excess fabric. These baggy shirts ballooned when tucked in and it was a horrible look, that's why we've grown up hearing we shouldn't tuck in our shirts. But these days lots of brands are creating trimmer options that look sleek and clean when tucked in, not frumpy and baggy. The trimmer cut goes by many names: trim cut, modern fit, custom fit, athletic fit, slim fit. Don't be scared, you don't have to be ripped to wear a shirt that fits. As long as it doesn't pull anywhere you'll look great. 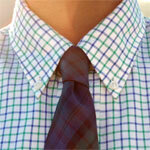 Style Q&A: What’s the Secret to Pulling Off the Casual Tie? Okay this may sound out in left field, but wearing a shirt that tight doesn’t allow for any concealment. And by that I mean belly, or for the tens of thousands of regular people who carry a firearm, concealment of that firearm so as not to freak people out. So while I am all for style, give me a style that provides some more coverage. Tight has nothing to do with it, it’s fit. I don’t want guys to buy shirts that are ‘tight.’ If someone can carry a gun and holster under their shirt without being able to see it, their shirt is definitely too big. Obviously, if carrying a concealed weapon is a priority or daily activity, adjustments will have to be made to accommodate that. That is what light jackets are made for. Anyone who wears his shirt over his trousers is a bloody wanker. I’d rather be an old fart than a young dickhead! You sound like an old dickhead. Hate to burst your bubble, but that photo is obviously professionally styled. I’m a fashion photographer… Lemmie fill you in on the tricks of the trade. The shirt on the “after” guy was either tailored for the shoot, or temporarily pinned at the back. If you want that look, almost no off-the-rack cut is going to give it to you, even the “fit”/”slim” stuff. You have to get your shirts tailored. Take in the sides, or darts if you have to… It costs about $20 to get the work done, so just mentally add it to the purchase cost. It’s funny. I actually prefer the “bad” one to the fitted shirt in these pictures, especially being tucked in to jeans. I don’t like overly baggy; but in my opinion shirts this fitted don’t look comfortable. Then again, I also wear my crew t-shirts visible so I’m in no way qualified to comment on style. Actually, I think you’d be surprised at how well the right brand of shirt can fit off the rack. I’m also a photographer, and am pretty familiar with pinning back shirts, but right off the top of my head I can think of Express Men and Gap Athletic that can totally fit that well right off the rack. Agreed. There is truth in saying that a lot have to be tailored, but I have gotten lucky on a few occasions with Gap and even AE. It just takes some patience. That said, I have also gotten frumpy crap from both places. I think there are more problems with that outfit than the tucked in shirt, haha. The boots are too light for the pants, the belt is not even close to matching the boots…and i personally do not like tucking a shirt in while wearing jeans. If I plan on wearing jeans, I usually make sure that my shirt tails are cut short enough that I don’t have to tuck it in. I think it looks very ridiculous to dress up jeans by tucking your shirt in. My friends and I usually make jokes about “jean tuckers”. Finding the brand that fits off the rack is the challenge. When you find it life is good. For me it’s John Varvatos, Ben Sherman and Spurr. Tucking a shirt in jeans is not ridiculous at all. As everyone else stated, it’s all about fit. If the jeans and shirt fit then it looks good. I get compliments all the time when I tuck in my shirt into jeans. Steve, I understand comfort can be an issue, but if you’ve never worn a properly fitting fitted shirt I think you might be surprised. It’s like saying an xxl t-shirt is more comfortable than the xl because there’s more room, even though you don’t need that room for size. I love desert boots of pretty much any color with dark jeans, and I’m not a strict sartorialist when it comes to belts matching shoes exactly. Different men have different style preferences for sure, it may not be for you. I love the way a casual tie looks with jeans, some swear never to wear a tie with jeans. In the end you have to take the rules and make them work for you. I find that whenever I sit down/reach for something/do anything besides standing around, even the most tailored of shirts will end up looking like the “bad” photo. The guy in the “good” photo looks like if he bent over everything will be pulled up and then the dreaded bunch will be created. My friends and I usually make jokes about guys who think your belt needs to match your shoes. You make a good point. The thing is with a fitted shirt, the bunch still looks waaay better than a ‘classic fit’ shirt. Tucking in your shirt can be like wearing a jacket, or tie, there’s inevitably going to be some maintenance. I’m surprised at the amount of negative reactions and snarky comments on this post. It’s a simple, straight-forward message. Buy shirts that fit you. The wrong example, guy in purple-ish shirt, looks terrible and fatter than he probably is. That’s what happens when you buy shirts that are regular cut, or are not your size. Buy shirts your size, and if you think you know your size, you probably don’t. So try on multiples and ask a pro. Buy slimmer cuts, you don’t need all that billowy fabric. Or, if you love billowy shirts and want to keep looking the way you do, then don’t listen to Andrew. Geez. I am about 5’9, 230lbs. Obviously, this puts “Modern Fit” or “Slim Fit” clothing out of my repertoire. Any other suggestions on making tucking in the shirt classy? Earlier this year I was in VERY MUCH he same boat as you. I’m 6’2″ and at the time was bordering on 270lbs (down almost 50lbs in the last 10 months). Best piece of advice i could give you is, in regards to fit, try and accentuate what features of your body you DO like. Broad shoulders? A shirt with chevron straps on it will accentuate those bad boys. Beastly forearms? Roll up those sleeves. As far as the fit along the waist line, make sure that when you wear your pants you wear them at the waistline. I know when I was at my highest weight I would rarely if ever wear my pants at the waist, they were usually well below, which only made the problem worse. Also, consider accesorizing in that area to draw attention away from the “muffin top” love handles. Things like (tastefully) large belt buckles, vests, and even ties can REALLY draw the eye away from a tummy. Solid colors and vertical patterns are your friend. Baggy “classic fit” clothes might make it feel like your extra poundage is less visible. It’s not. Now its just being covered by poorly fitting clothing. The best thing to do (besides working to get to look the way you want to) is to draw attention AWAY from the extra padding, not try to hide it outright. Just my advice, but I hope it makes some sense to you! I think you’d be surprised how affordable a tailor can be, and just how much difference it can make for those of us who have body shapes that may not fit right into store-bought shirts. I completely agree with Ricardo. Also, don’t write off the Modern Fits yet, they’re not just for pencil-thin guys. They’re just cut less billowy. No one, thin or wide, should be wearing tight shirts. Check out the picture on our Blank Label review, Robert is probably 230 at that point and he looks fantastic because his shirt fits correctly. I didn’t expect my comments to offend others. I think an outfit with fewer color changes looks more streamlined and clean. 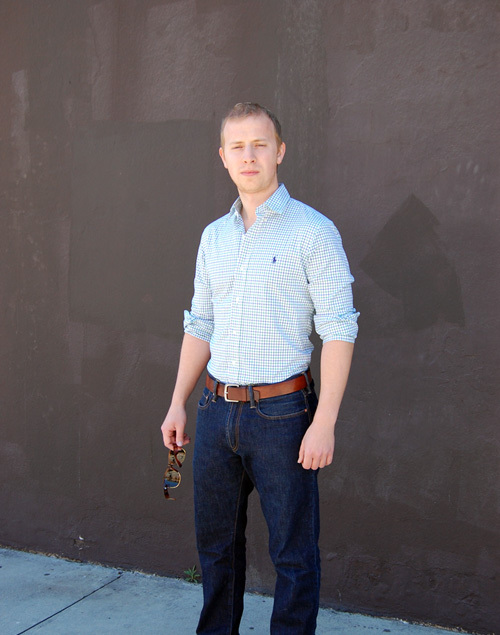 The outfit in the photo has a lot of abrupt color changes from the shoes to the jeans to the belt to the shirt. This is definitely digressing from the point of the article though. The shirt tucked in jeans look just isn’t my favorite. I think you can swap out the jeans for some casual dockers pants and look a lot better, while being more comfortable. 5OCS, no worries! To each his own, especially with style. I love a pair of khakis, but am more comfortable in jeans for sure. Once, two of my sons were in public with me. They were both wearing their baseball caps turned to the sides. I told them that it made them look retarded (not a politically correct statement, I know, but hang with me). They decided to ignore my comment because they felt, in their infinite lack of wisdom, that they knew better than wise ol’ dad. As we walked a few feet further in a crowd of people, a man with down’s syndrome headed towards us wearing a baseball cap that was turned to the side. I said nothing to my two sons, however, I noticed that their mouths dropped open and they both adjusted their hats to the front and have continued to do so to this day. Ill fitting and untucked shirts look juvenile at best and sloppy at worst. Take it from a very well dressed middle aged business man who had a sharp dressed “Mad Men” era dad to teach him and who now has 5 sons that he carefully teaches mostly through example. The choice is yours to act and look like a grown up or not, however, that doesn’t change the fact that an ill fitting or untucked shirt just plain looks retarded. Always has, always will. You cannot break universal laws, you can only break yourself against them. Good story and interesting perspective. I agree with most of what you said and I would offer a follow up comment. For the most part, I am a guy that views clothing as having a purpose (one of the reasons I don’t wear jeans often besides more comfortable alternatives). With that said, I tend to view jeans similar to how I view t-shirts…I will reach for something nicer unless I am working on a car. Jeans were primarily made for the purpose of working in fields and then for those in the gold rush. They were then primarily worn by blue-collar workers, hippies and 1980s hair bands. My bias is based on all of those things and when I think about pairing a $80 Ralph Lauren shirt (intended for dress), with a $40 pair of Gap jeans (intended for work), it seems to like and feel wrong. It is kind of the same concept as wearing a t-shirt with a suit for me. Or a polo with a suit. I don’t know if I could ever do it. Good job with the kids though. I have always vowed to make sure my kids don’t end up dressing overly casual and rebellious. Great article, I’m on the slim side & do have older shirts that look like the purple one in this article, will start checking for a more fitted look, also have a 22yr old son, wears printed tshirts 90% of the time, slowly trying to encourage him to broaden his horizon & to read these articles. @William…I agree with Andrew and Ricardo. It may be time consuming at first, but spending some time finding the correct sizing is important; and you can wear a more modern cut without the shirt being too tight. Also…the pattern of the shirt plays a big part. A shift in the pattern can make the same “size” fit differently from brand to brand; which is why it can helpful to try different brands and see how that pattern looks on your body. Meowwwwww….hss, hss. I didn’t know my bros were so nitpicky about their clothes and downright catty about someone else’s. As for me, goin’ out to the back 40 and choppin’ some firewood. I read this article and your article on the Anon sunglasses. Are they no longer available? The link on the previous article is broken. Wow. It’s so strange how styles and opinions have to change so drastically. 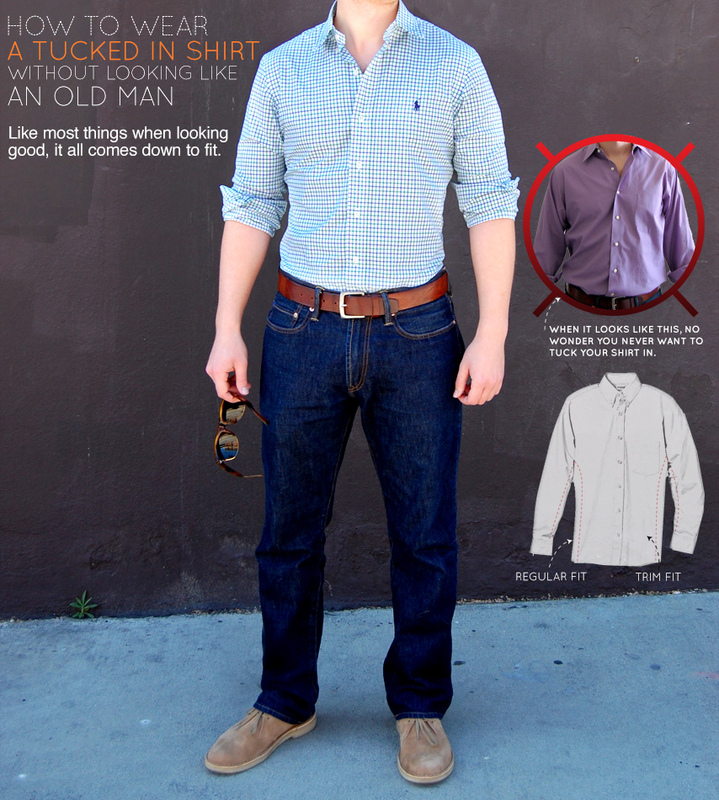 Now if you tuck in your shirt, you’re a nerd or an old man? Before, it just meant you were a slob. And that’s what it’ll probably mean again in another decade. It’s like hair styles. Incredibly long, then incredibly short. No in-betweens. No moderation. I guess I’ll just keep tucking my T-shirt into my jeans until it becomes the socially acceptable norm once again. Fads. Trends. Gotta love ’em. I use Shurt Clip to help keep my shirt tucked in. Easy and convenient. Two words for keeping your shirt down and not looking like a hot mess; “shirt stays”. They attach to the bottom of the shirt and the top of your socks. Bam! No muffin top of shirt sticking out of the pants. Any army navy store will sell them. Anytime I wear a tucked in shirt these babies come out. what about buying a ‘regular’ fit shirt and getting it tailored instead? Just a comment from a girl – the “after” is infinitely more attractive than the before. Very few things are sexier than a man who puts a little effort into how he looks. Not a pretty boy, but a man with a little style. Meow! If concealed carry is a desire, check out Thesis Holsters. They are holsters that go inside the waist and a shirt can be tucked over it. This is what I carry with and at 5′ 10″ 175 lbs with a thin build who wears slim fit everything it conceals very nicely. What brands do you recommend for man that are 5.6? I am having a really hard time finding a shirt that isn’t too long..
It’s rather funny that my coworker and I represent the two examples in the article, him wearing the 90’s JC Penney Sale’s Associate outfit to work every day while I try to spruce things up and wear more trim-fit outfits that work out aesthetically. I have showed him this magazine many times but he would rather stick to his square-toed shoes, poorly-fitted pants, and two-sizes-too-big shirt. There’s no way the guy in the picture is getting laid looking like that. And, after all, isn’t that what style is about? Every girl out there will laugh at a guy with a dress shirt tucked into jeans and his belt showing.